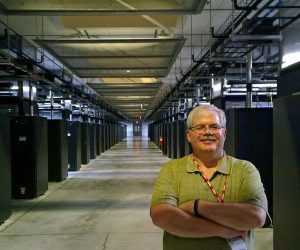 Rich Miller, founder, Data Center Frontier, visits a data center. Something he does often! Data center news you can use! Sign up for the Data Center Frontier newsletter and get the latest news on new trends and innovation in the data center industry with our twice per week (Tuesdays and Fridays) news blast. With longer articles and more in-depth reporting, we dive into the details and take a comprehensive look at trends, and the industry. Our storytelling is visual and compelling, taking our readers inside mega cloud data centers as well as other sites that few get to see in-person. View our previous email newsletters here. Return to Data Center Frontier Home.